"Robin sat on the windowsill of the little cottage. With his plain brown belly pressed against the windowpane, he watched everything that Lady Winter did. "Oh no!" he cried. "Sister Spring mustn't sleep forever! What will we do without spring?" 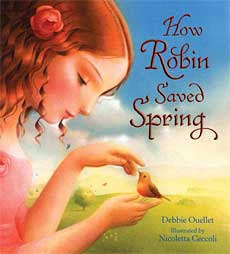 - How Robin Saved Spring by Debbie Ouellet, illustrated by Nicoletta Ceccoli. How Robin Saved Spring has one of those gorgeous covers that catches your eye. The image of a girl gently holding a robin looks so tender and sweet, I was instantly drawn to the book. What I didn't expect was the creative and interesting story inside - a kind of folklore type tale written by Debbie Ouellet. 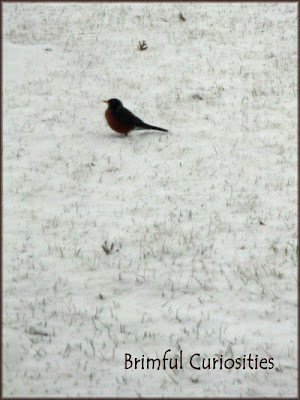 The book provides an unusual, fictional reason why the robin has a red belly and hides during the winter. The story begins with two powerful sisters, Lady Winter and Sister Spring, who reside together in a little cottage. It's wintertime and Lady Winter wants to keep it that way forever. Her perfect world is one covered in snow and ice. When the time comes for Sister Spring to wake up, Lady Winter knits a magical white blanket and places it over her sister so that she will continue to sleep. The creatures in the forest learn of Lady Winter's actions and desperately want spring to arrive. They band together and each take a turn trying to wake up Sister Spring, but Lady Winter proves to be a formidable foe. If you've ever pondered why a ladybug has spots, how a skunk got his stripe, why the maple tree gushes sweet sap, and about that red-bellied robin, you should read this fascinating tale. My daughter found the story extremely engaging, and the telling also presented an interesting teaching opportunity for me. Separating fact from fiction is hard for preschoolers and they are naturally inquisitive. She really wanted to know why robin has a red breast. Reading How Robin Saved Spring gave me the chance to discuss the difference between fantasy and reality and also nurture her imagination. The intriguing, luminous illustrations by Nicoletta Ceccoli give the story a perfect dreamy fantasy feel and really capture the true qualities of the sisters. Lady Winter's snow white hair contrasts well with Sister Spring's lively personality, red hair and nurturing ways (vines grow around her head even as she sleeps). Does the robin truly say, UP, UP? If you want to listen to a robin's cheerful song, cheerily, cheeriup, cheerio, cheeriup visit BirdJam to hear a splendid recording and read more about the call. 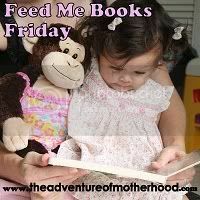 This week's Feed Me Books Friday theme at The Adventure of Motherhood is Spring and Easter. Link up your favorites there. 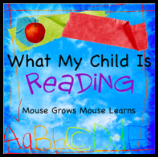 Head on over to Mouse Grows, Mouse Learns to post what your children have been reading. I am an Amazon affiliate and may receive a very small commission for products purchased through my Amazon links. Beautiful cover! I love imaginative books, and how you used the opportunity to talk about fiction vs. reality. Thank you for this recommendation and for including the sound we could hear of the robin. I agree the cover is enough to draw me in but I love spring too so this looks like a winner. So glad to have you link up! Sounds just lovely! I'll have to look it up. We've got robins hopping all around here. Poor things are in the snow now. Sounds like a good book. We spotted our first Robin about a month ago, real early for here. Now we have them all over. This book sounds like one I wouldn't mind just adding to Selena's library of books. That book sounds positively adorable. I think I'm going to have to hunt it down. I think I've read another book with the same illustrator. yes, what an eye-catching cover! so colorful and tender. the theme sounds perfect for this time of year ... thanks for the review and introduction to HOW ROBIN SAVED SPRING! This book sounds like a great find. Thanks for sharing!